The annual Persecution Trends Report by the U.K.-based group Release International, which also helps persecuted Christians, warns that Christians in China look set to face a harsh new year, noting that the communist country has been cracking down on Christmas celebrations in some districts, banning Santa Claus and Christmas hats to further tighten its squeeze on Christianity. China, the report says, is "a key country of concern for 2018." In February, the atheist state will gain greater control over churches and other places of worship by bringing into force tougher regulations on religious affairs, the report says. "Those new rules will mean unregistered house churches will face increasingly tough measures to control their activities." According to the regulations, anyone who organizes unapproved religious activities will be fined for up to $45,200 and anyone who provides a venue for "illegal religious events" will be fined up to about $30,100. Moreover, the directive empowers lower-level authorities to take action on "unsanctioned religious activities." 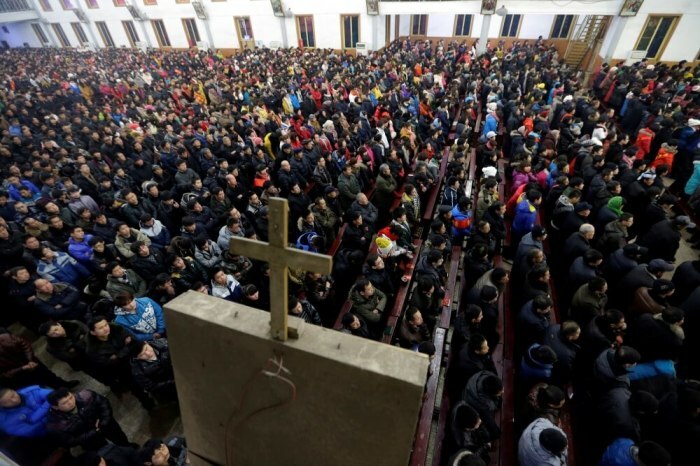 Chinese Christians endured many hardships this year, among them being the detention of 13 worshipers who were attending Sunday service at a small house church that was raided by police; the torture of a pastor sentenced to 12 years in prison; and seven-year prison sentences being handed down to people who were in possession of Christian devotionals. Since late last year, the provinces of Liaoning, Jilin and Heilongjiang in northeastern China have deported hundreds out of around 1,000 South Korean pastors and missionaries there in an attempt to close down their churches. The Communist Party fears that foreign powers are working to undermine its authority by supporting Christianity. The party recently revealed a new leadership line-up without a clear successor to President Xi Jinping, meaning that he is likely to continue being a top figure even beyond the end of his second term in power in 2022. Also, the party recently voted to enshrine Xi's name and ideology into its constitution, elevating him to the level of Chairman Mao Zedong, the founder of the People's Republic of China. Another country of concern is Nigeria, where Christian villages have been coming under sustained attack by armed Fulani herdsman, the report says, explaining that the militants are driving Christians from their farms, killing and displacing thousands. According to a Nigerian partner of Release, the Fulani are being armed and encouraged to drive out Christians from the north in pursuit of an Islamist agenda. The Christian Post reported recently that Islamic Fulani herdsmen in northeastern Nigeria, who have been accused of aligning with the Boko Haram terror group, killed more than 100 Christians earlier this month, with the suspected help of the military. Attacks against Christians are also increasing in India, "fostered by militants, who believe that every Indian should be a Hindu," the report says. Extremists have been pressurising officials to close churches and prevent Christian services. Christian persecution has steeply risen in India since the Hindu rightwing Bharatiya Janata Party won the general election in 2014. The first quarter of 2017 saw 248 incidents of persecution, and by the end of June, the number grew to 410, a recent report by Open Doors said, noting that a total of 441 incidents were reported in all of 2016. Last week, 30 seminary students and two priests were arrested for singing Christmas carols, a tradition that has been going on for the last 30 years. Earlier this year, the U.S.-based Christian child sponsorship organization Compassion International was forced to shut down operations amid an ongoing crackdown by the country's Hindu nationalist government on nonprofits that receive foreign funds. The report also raises concerns over persecution of Christians in Vietnam, Iran and Egypt, and asks Christians to pledge to pray for the persecuted throughout 2018.